Accept ’em and dump ’em. Nobody knows exactly how many law school students nationwide lose scholarships each year — no oversight body tallies that figure. Um, why is the ABA sitting around waiting for somebody to contact them about this? Well, US News could contact them, right? Dear law students: law school means getting used to being screwed by those who should be looking out for educating better lawyers. 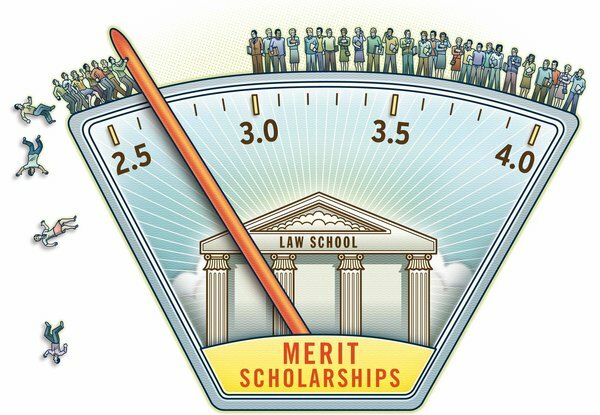 In a forthcoming paper, Professor [Jerry] Organ [of St. Thomas School of Law] proposes a simple system of greater disclosure that, among other figures, would detail the number and percentage of students on scholarships in all three years. Incoming law students might hope for that, so as to avoid accepting a merit scholarship and losing it after one year, leaving $60,000 to pay for the other two years. PS: This post owed to Tim O’Reilly.